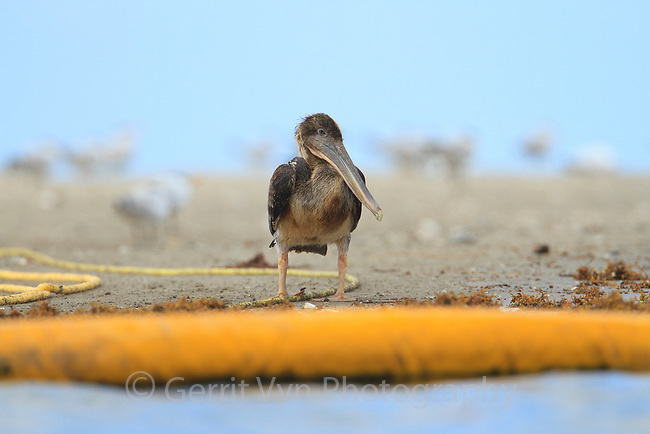 An oiled and emaciated young Brown Pelican (Pelecanus occidentalis) stands on the beach near a nesting colony awaiting death. Many young birds, even those lightly oiled, will be unable to make the transition to feeding themselves at sea as the result of oil damaged plumage. This bird and its nesting colony were oiled by the BP Deepwater Horizon oil leak in the Gulf of Mexico. Raccoon Island, Terrebonne Parish, Louisiana. July 2010.